The first time I saw a recipe for a Mediterranean Bowl my initial thought was “WTF is a Mediterranean Bowl?”. But here it is, my version of a delicious Mediterranean Bowl. Well of course if you have the hummus, the tzatziki, + the quinoa ready. Other than that – the salad takes a second. Now, this is the kind of recipe that I would meal prep all the different parts for (except the salad). Salad: Wash the vegetables, chop them, place in a mixing bowl. Add olive oil, vinegar, and salt to taste. 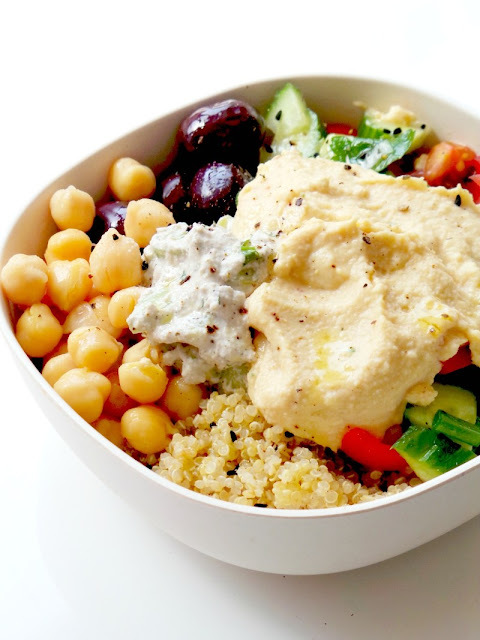 Assemble your bowl: Salad, rinsed and drained chickpeas, the olives, quinoa. In the middle/on top: 2 tbsp hummus and 1 tbsp tzatziki + freshly ground black pepper. Ready. Instead of tzatziki, here I used this recipe. This similar salad would also go well in this bowl (not vegan). Meal Prep option: Keep all parts of this Mediterranean Bowl in separate containers in the fridge and assemble just before serving. Instead of the fresh salad you can also pre-cut a cucumber and use whole cherry tomatoes. 0 Response to "5-MINUTE MEDITERRANEAN BOWL – HEALTHY LUNCH MEAL PREP RECIPE "